You’ve been starving all morning, you need something satisfying to help get you through a long afternoon at the office and power you through your workout – all whilst helping you lose weight. Sounds like a tall order, right? Luckily, we’ve got you covered with everything you need to know to make the best lunch for weight loss. We know we say this about every meal … but lunch is basically the most important meal of the day! Seriously though, this midday fuel-up is essential, especially if you’re on a diet. It needs to be tasty, substantial and packed with all the right stuff to keep you powering through the afternoon, whatever you have planned. If it’s lacking in flavor, you’ll feel uninspired and get bored of your diet faster than you can say “it’s just a cheat meal”. If it’s not substantial enough, you’ll get hungry and give in to those damned delicious sweet treats someone’s cruelly left on the counter in the office kitchen. Bubye diet. But most importantly, if it isn’t well balanced and made up of healthy nutrients, you won’t get the results you’re looking for. And there’s nothing worse than that, girl. It’s a lot to think about for one meal, but don’t worry, we’ve got you covered. From what it takes to make a healthy midday meal to recipe examples, SMG knows what it takes to create the best lunch for weight loss. What makes the best lunch for weight loss? The number one rule of dropping the pounds is this, girl: You’ll only lose weight if you’re in a calorie deficit. That’s it. There’s no secret diet or magical trick. If you combine that fact with a little determination and dedication, you’ll get the results you’re looking for. To lose weight safely, you need to be consuming between 15-20% fewer calories that you would normally expend in a day. Figure out your recommended carb, protein and fat intake with this guide to the IIFYM diet. With that in mind, you need to ensure your lunchtime dish is calorie controlled. That means weighing out some ingredients and maybe even tracking your meals to ensure you’re not overeating without realizing it. The next rule of the best lunch for weight loss is go for a high protein option. If you’re working out, which of course you should be if you plan to lose weight, then extra protein will increase protein synthesis which can lead to more muscle. If that happens, your metabolism will be higher and you should burn more fat. There is also evidence to suggest those who eat more protein have a better body composition aka they’ve got a good muscle mass and lower fat. The recommended amount of protein you eat should equate to between 1.4-2g per kg of bodyweight . To complement that, we’re going to make sure you’re getting enough fats and complex carbohydrates. This will keep you feeling full and energized on your low-calorie diet. Your dish will also be accompanied by plenty of veggies to ensure your bod is nourished by your lunchtime meal. Lunch can often be a difficult one, especially if you work. It’s so easy to just head to the store and buy yourself something that might be tasty, but is no friend to your waistline. The best way to combat this is to be prepared. Literally. By mastering the art of meal prep, you can line up a delicious, healthy meal for every day of the week, all in one go. So, when it comes to grabbing lunch, you can simply head to your fridge where everything will be organized and ready to eat. 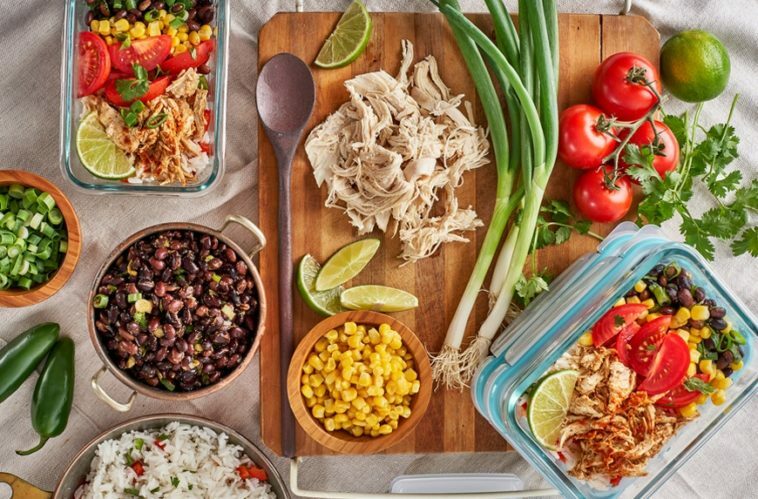 Become a pro and read our guide on how to meal prep for weight loss. The humble sandwich is a staple of a delicious, satisfying lunch – but that doesn’t mean it has to be unhealthy. We’re going to put a twist on this meal that will have you dropping the pounds in no time. We’ve swapped out that unhealthy white loaf for a whole-wheat option that will keep you full and give you a nice slow release of energy that will last all afternoon. Instead of fatty, high calorie fillers, we’ve also loaded this option with high protein turkey, some nutritious salad and tomatoes. Enjoy! That’s right, you heard us! 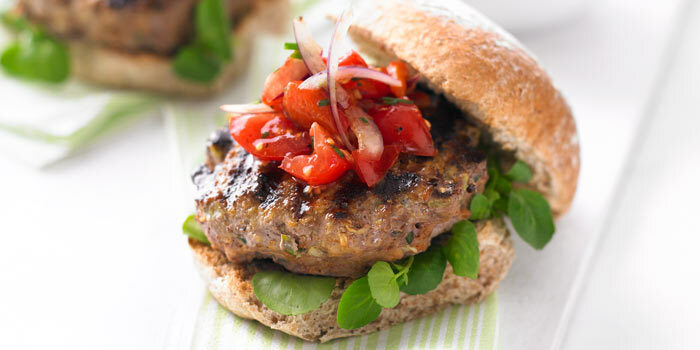 A burger can be a healthy addition to your lunchtime menu if you know how. Luckily for you, we do know how. Follow these steps and not only will you lose weight, you’ll be the envy of everyone else at lunch. Pick out a healthier burger when you’re hitting the store. By this we mean look for an option that’s made of leaner meat. That will mean it’s high in protein, but with less fat content so the calories will be significantly reduced. Perfect for a weight loss lunch. For all you plant-based girls out there, have we got a treat for you. 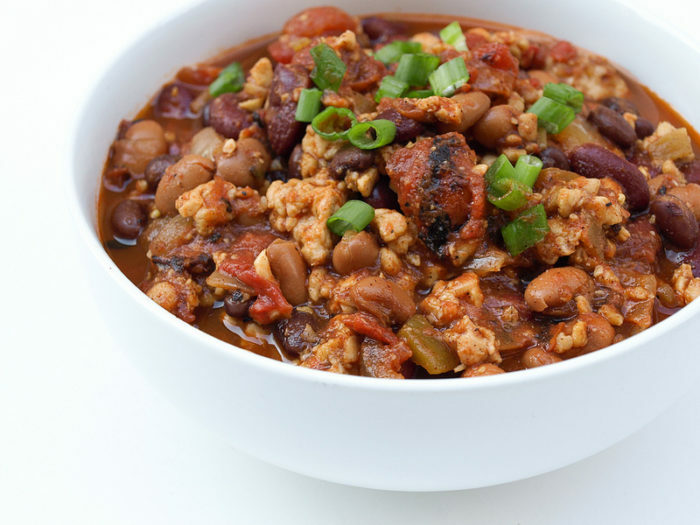 We’ve created a delicious, balanced tempeh chili that’ll keep you topped up on that all-important, muscle-building amino acid – protein. This dish not only contains a complete amino acid profile for maximum effect, it’s also got plenty of healthy carbs and fats to keep you going. It’s a classic comfort food dish, and something that’ll leave you feeling satisfied and full until you’re ready to hit the gym after work. 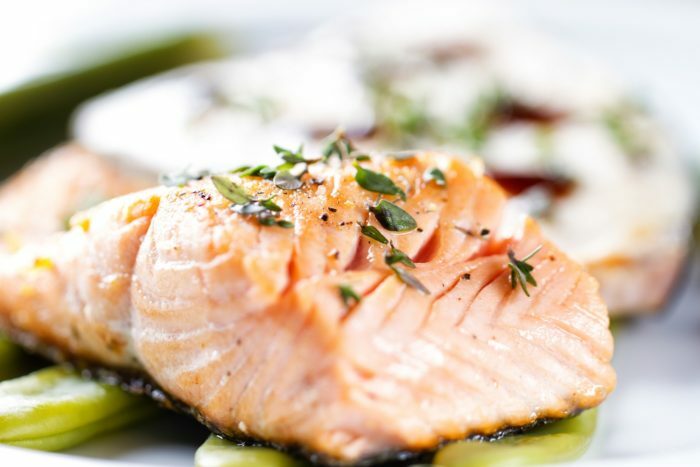 Salmon is packed with healthy fats and loads of protein to keep you on track with your diet and feeling full. Also, lets just get it out in the open, salmon is delish. So, ignore the looks from your co-workouts when you re-heat this one in the office kitchen, they’re probably just jealous anyway. We’ve paired this one with some nutritious veggies and a sweet potato, so your body is fully fueled to take on the rest of the afternoon and lose weight. It’s a classic for a reason. This dish is packed with protein, brimming with nutrients and low in calories. What more could you ask for in a healthy lunch?! 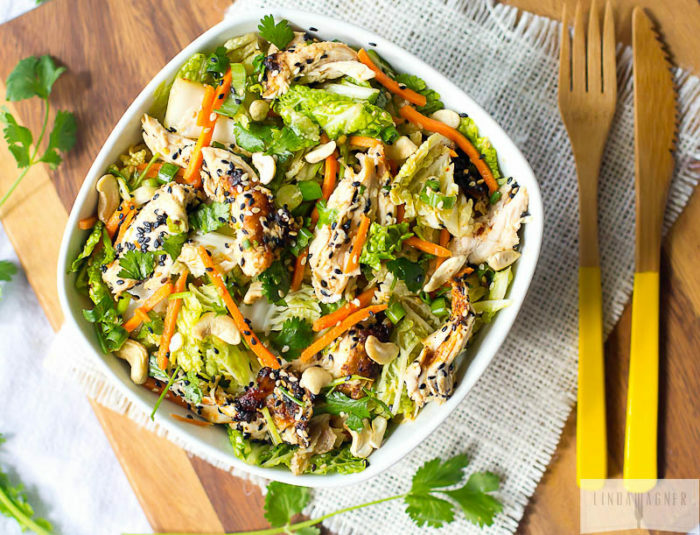 The place where most chicken salads fall down is the dressing. So many people make a fantastic, healthy lunch, then cover it in high calorie salad dressings that blow your diet efforts out of the water. To combat this, we’re recommending you use a low-calorie option and you should be good from there. Hungry for more? Perfect your weight loss breakfast too with this guide from SMG. Say goodbye to those fast, unhealthy lunches and hello to real fat loss with these delicious, nutritious meals. They’ve got everything you need to make your body composition dreams a reality. Simply pair them with a healthy, active lifestyle and you’re good to go girl. Put your culinary skills under the spotlight and whip up one of these tasty dishes today.